Some locations ran out of cups early in the morning causing excited coffee drinkers to lash out. How limited is a limited supply? That's the question that has been flooding Starbucks' Twitter account after many annoyed patrons were unable to take advantage of the coffee chain's free, reusable cup giveaway on Friday. 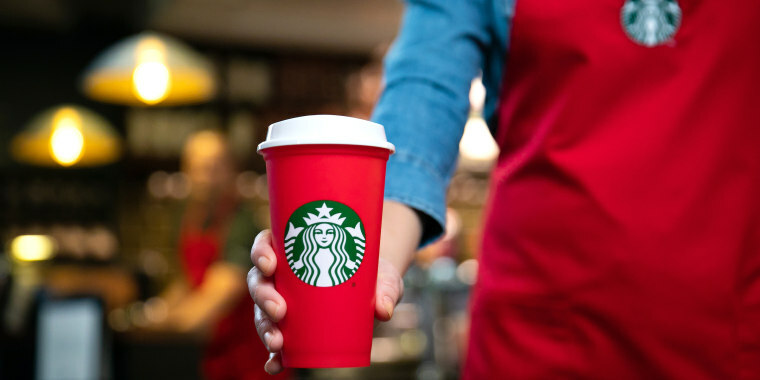 Last week, the day before it launched its annual holiday beverage cups, Starbucks announced that, for the first time ever, it would be offering a reusable version of its red holiday cup — and that it would be giving away an unspecified number of those cups for free on Nov. 2. The new designs debuted with the release of the chain's popular wintry beverage flavors, like White Chocolate Mocha, Caramel Brulée Latte, Chestnut Praline Latte and Eggnog Latte. Introducing the limited-edition #Reusable #RedCup! Tomorrow (Nov. 2), get yours for free with the purchase of any holiday drink, and celebrate all season long. Coffee fans were initially quite jolly about the prospect of being able to snag a reusable cup they would be able use again and again throughout the season. But come Friday morning, many coffee drinkers arrived at their local Starbucks stores only to find a holiday spread ... with no gifts. The unexpectedly limited amount of freebies left fans saying "that's hardly 'while supplies last.'" One tweeter couldn't believe the cups were gone already at at 7:05 a.m.
And with so people many complaining about not being able to receive cups (even after calling the store), some tweeted that Starbucks should disclose just how many cups are actually included in a limited supply. While supplies last. @Starbucks should post how many are supplied to each location, what time the promotion starts, and this way people know what to expect. Instead of waiting in a drive thru line and being told at the window “oh, ...” while still paying $6 for a holiday drink! Of course, some lucky people (probably very, very early risers) did get a cup — and they were pretty pumped about it. On Friday, the coffee chain faced another hiccup when its app experienced technical difficulties. When customers complained, Starbucks began apologizing directly to some consumers via social media. There's no list available and we're so sorry for the difficulties as we're currently having MOP issues at this moment. Please know that we're quickly working to resolve them. For those who weren't able to score a free cup, Starbucks is hoping to redeem itself like the Grinch on Christmas. A company spokesperson told TODAY Food that overall the chain was pleased with the enthusiasm surrounding its reusable cup promotion. And while its initial announcement said each store had a "limited supply" to be given away, the coffee chain will now offer the cup for $2.50. Those who purchase the cup will also receive the same offer as those who nabbed the cup for free: 50 cents off a grande holiday beverage (which is 16 ounces) order through Jan. 7. The reusable cups do not work with mobile ordering at this time. To use a reusable cup you must visit us in-store or utilize the drive-thru (be sure to let them know that you have a reusable cup!). The chain also clarified that in order to cash in on the reusable cup deal, customers must make their purchase in store and not through the app.